Seven hundred olive trees were uprooted first thing in the morning of 16th May while a bulldozer got to work destroying the farmer’s concrete water storage facility and surrounding dry stone walls and fences in Aqraba. 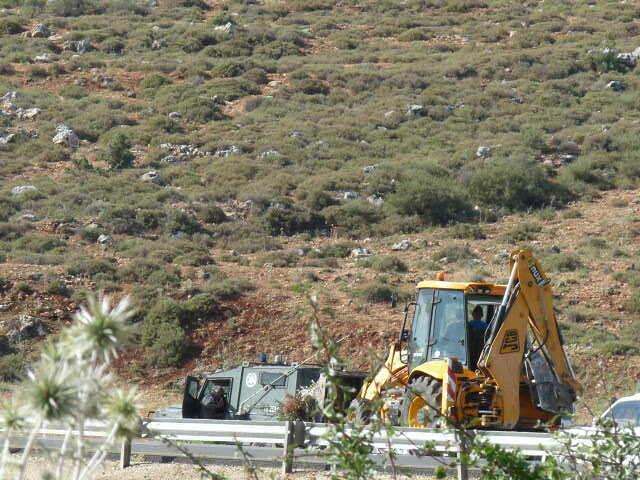 The Israeli army, who did some of the damage along with specially contracted workers, has since returned to check that the ground has not been replanted. Arriving at 6am, the military came in jeeps and with a bulldozer and, along with the other workers, began to trash the wire fence enclosing the area and pull up the trees on it by hand. They came without any prior notification. 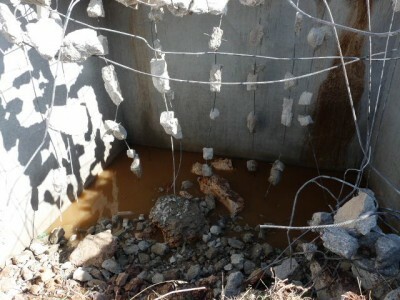 When the mayor made a complaint on the scene at about 8am, saying that demolitions cannot happen without the land owner being warned and signing a confirmation as such; even citing several simple ways in which the owner or, at least, the municipality could be informed. He was told that an order had been delivered and placed “on a rock” there some “two years ago”. Just getting there had been arduous for him and other council workers, as troops had been placed to block access to the site, where in total there were approximately twenty of them plus two officers. The water tank, now little more than a pile of rubble exposed in a hole in the ground, could hold three hundred cubic metres of water before. Around it, huge boulders that formally made up short walls, were dumped in such a way on the vandalised land as to prevent easy replanting or rebuilding there. The young olive trees had been planted in 2011 by the owner following a move from Dubai, with the fence once going around them meant to indicate that it is privately-owned land. 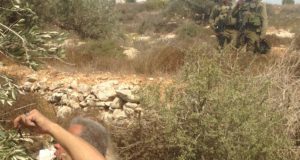 The site straddles the boundary between Areas B and C; arbitrarily divided up into zones where Palestinian civil control is either nominal (B) or otherwise replaced by administration by the Israeli military (C). 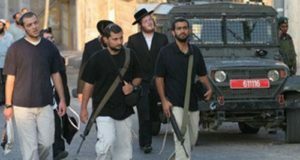 While huge swathes of Area C are under the threat of home and property demolition where they have Palestinian and Bedouin population, much of the rest is given over to military training. Area C is notorious for Palestinians being near-incapable of gaining any form of building permit, while work without one is liable to removed soon after discovery by the occupiers. 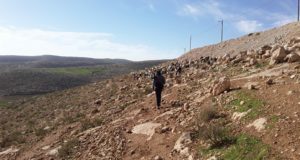 “All land of Aqraba that can be used economically is to the east reaching to the Jordan River”, the mayor said. 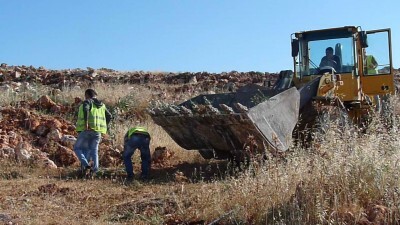 “If we could use these lands, Aqraba would be rich, but this is not allowed in Area C. Farmers are prohibited from the land and the Israelis bring soldiers and settlers and use the land in an economic way, which means that the military order is only a trick to use the land in an economic way”. Adding as well that, “court freezes demolitions, it does not allow for rehabilitation [of the land]”. The land lies in the southwest of Aqraba. Further in the same direction is the hamlet of al-Taweel. There thirty families get electricity from power lines constructed by Belgian foreign aid, along with a school and a mosque. These lines, in service since 2004, are slated for demolition and a final decision on this is pending in court. A small house and shed for a farmer’s sheep there was demolished and then the animal shelter was rebuilt in protest,with the owner taken to court in February. Families there are frequently evicted temporarily to make use of their land for military exercises.